‘The Pupil Premium is additional funding given to schools so that they can support their disadvantaged pupils and close the attainment gap between them and their peers. 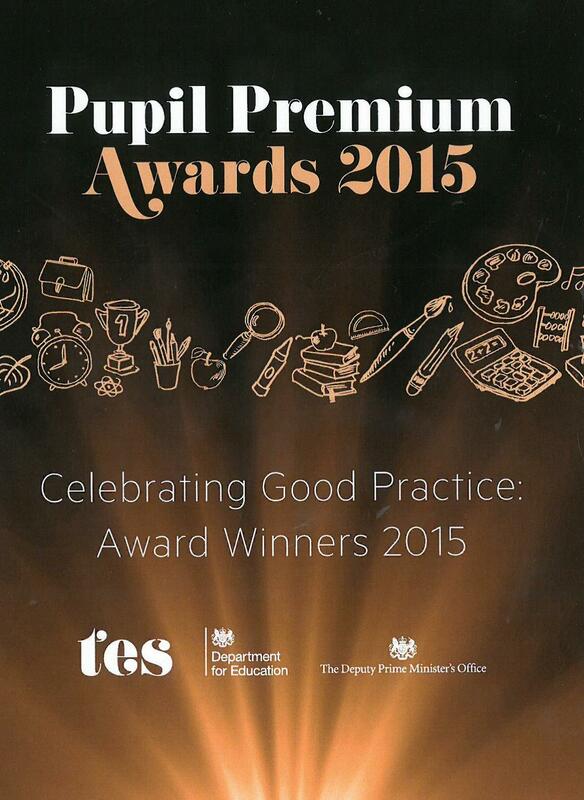 The Pupil Premium rose to £1.875 billion in 2013-14. The Pupil Premium was introduced in April 2011 and is allocated to schools to work with pupils who have been registered for free school meals at any point in the last six years (known as ‘Ever 6 FSM’). Schools also receive funding for children who have been looked after continuously for more than six months and children of service personnel. To close the gap in attainment for PPG pupils in core subjects. To maintain high expectations and standards for pupils on PPG. To ensure that all pupils are given the same opportunities to develop their potential and participate in extra-curricular activities in and outside of school. 1. PPG pupils combined attainment is at least the same as non-PPG pupils 88%+ of PPG pupils to achieve at least expected standard in Reading / Writing / Maths combined. 2. PPG pupils’ progress is at least the same as non-PPG pupils. PPG pupils to progress at similar / higher rate than non-PPG pupils. Target in 2018-2019 of Value Added score of 2+. PPG pupils to have at least 95%+ attendance figure. Any persistent absentees, engaged with successfully. 4. PPG pupils are represented in extra-curricular clubs and trips. PPG pupils take up places in extra-curricular activities and school trips / residentials. The three heading below enable schools to demonstrate how they are using the Pupil Premium to improve classroom pedagogy, provide targeted support and support whole school strategies. Desired outcome? Chosen approach / action? Evidence for this strategy? How will you ensure that it is implemented well? Staff lead? When will you review this? PPG pupils attain at least in line with non-PPG group in Reading / Writing / Maths. PPG pupils to make Value Added progress at / above NA. PPG pupils are monitored and tracked carefully throughout the year during Pupil Progress Meetings (PPM). Challenging targets for all pupils set. During previous years, this level of focus, tracking and targeting has had positive results. Discussion of every pupil during termly PPMs and half termly action checks. Discussion of whether pupils are on track to meet / exceed targets. PPG pupils to make Value Added progress at / above NA (for non-PPG pupils). Class teachers to carefully differentiate planning to cater for needs of pupils (SEN, LA, MA,HA, More Able). Clear and regular differentiation provides the support and challenge that enables pupils to make good progress. Subject leaders to monitor planning to ensure appropriate differentiation in place. During short, half termly formal observations, SLT to focus on differentiation in planning and activities. PPG pupils to make Value Added progress at / above NA (for non-PPG pupils). Half termly book scrutinies and discussion with pupils. SENCO to ensure that all PPG children have some additional input (whether in TA target group / More Able group / Booster sessions). Previous year’s data has shown this careful provision has led to positive results. Discussion with HLTA running interventions. Class TAs target groups / individuals in Reading / Writing / Maths. Withdrawn intervention groups for Reading / Writing / Maths. Targeted, focused small group support can help to address gaps in understanding. Small group allows more time to be given to particular pupils. Intervention data tracking (baseline and interval data). Data tracking / progress checking on 3BM sheets and SIMS marksheets. Observation evidence (of whole class and TA observations). Booster Groups (e.g. Reading Comprehension / 1:1 Reading / Spelling groups / Maths groups / Writing Journals) to support those at risk of underachieving. Groups run by Intervention Teacher / Head Teacher / Deputy Head Teacher / SENCO / HLTA. Booster Groups for the More Able to aim for above expected attainment. Small group, focused teaching allows pupils more time with a member of staff to revise and practise. Data from previous years has shown positive benefit of these groups. For PPG pupils to develop good self-esteem and for support to be provided for those deemed vulnerable (socially / emotionally). Record of mentoring sessions / assessed progress towards targets. Discussions with pupils and families. For target PPG pupils to develop age appropriate speaking and listening skills and grow in confidence when communicating. Trained SLIT (Sensory Language Impairment Teacher) takes children for targeted interventions focused on developing pupils’ ability to communicate effectively; improve Reading, Writing and Maths attainment. Previous experience with SLIT teacher had positive benefit on pupils. SENCO to liaise with staff member to review interventions. For target PPG pupils to develop age appropriate speaking and listening skills and grow in confidence when communicating. Member of staff with responsibility for EAL targets individuals and groups focusing on language development, Reading, Writing and confidence-building. Interventions successful in previous years. Pupils enabled to grow in confidence and develop spoken and written English. SENCO to liaise with EAL leader to review intervention timetable and effectiveness. Tracking data on 3BM and SIMs. Discussion with pupils and families. PPG pupils to make Value Added progress at / above NA (for non-PPG pupils). Purchase of study guides / resources that children can borrow in the run up to SATs. In previous years, pupils engaging in extra home learning attained well and made good progress. Discussion with pupils about home learning routine. Discussion with parents at parents’ meetings. PPG pupils to take part in all areas of school life. Financial support / subsidies available for pupils in relation to uniforms / after school clubs / sports clubs / breakfast clubs / music tuition / school trips / school residential trips. Inclusiveness builds confidence and positive self-esteem. When pupils and families feel included, they often are more committed to all of school life. Opportunities that clubs / trips bring can have positive impact on educational attainment and progress; as well as developing key life skills (independence / keeping safe etc). Checking after school club registers. Any persistent absentees engaged with successfully. Funding for Attendance Officer role to follow up daily attendance issues. Liaise with families / staff / Early Help. National data shows trend between poor attendance and underachieving. Improving attendance has positive impact on attainment / progress. Checking attendance reports and patterns. Discussions with families and pupils. Close partnership with Early Help and School Nurse as appropriate. Multi sports club after school Targeted approach for after school sports club to encourage PPG pupils to be active, engaged and provided with enrichment opportunities. Improve pupils’ concentration, focus and problem solving. Weekly small group chess intervention. Widespread evidence that chess can improve concentration and problem solving skills. Review how group are getting on in class. Desired outcome? Chosen approach / action? Impact? Lessons Learned? Cost? Aspirational target setting and thorough tracking of pupil data; areas of strength and areas for development identified. Focus on PPG pupils. Discussion of pupils during PPMs. · EYFS GLD All pupils 83% / PPG 100% (1/1 PPG pupils). · Year 1 Phonics – 89% Pass Rate / PPG 67% (2/3 PPG pupils). · KS1 – Reading 93% EXS / PPG 100% (5/5 PPG pupils) – Writing 93% / PPG 100% (5/5 PPG pupils) – Maths 86% / PPG 60% (3/5 PPG pupils). · KS2 – 72% R/W/M combined / PPG 80% (8/10 PPG pupils). NA 64% / Non PPG combined NA 70%. · KS2 – 17% R/W/M High ‘attainment’ / PPG 30% (4 PPG pupils). NA 10% / Non PPG combined NA 12%. · Scaled Score average combined 105.7 / PPG 105.6. NA 105. Non PPG NA – 105.8. · VA progress – Reading All pupils 0.34 / PPG 1.37 (9 PPG pupils) (NA All pupils 0). · Writing All pupils 1.74 / PPG 2.95 (9 PPG pupils) (NA All pupils 0). · Maths All pupils -0.78 / PPG -1.17 (9 PPG pupils) (NA All pupils 0). + Targeting more pupils who were EXP in Reading at end of EYFS to convert to Greater Depth at end of Year 2. + Continue with 1:1 reading interventions with target Year 6 pupils. + Even greater focus on starting points for all pupils. Focusing carefully on transition from EYFS, to Year 1 to end of KS1. Update class maps termly with starting point information and other contextual information. + Focus marking on ‘explain’ ‘demonstrate’ especially in Maths for pupils to develop their reasoning skills. + HLTA focus group in EYFS showed positive results. + Continue with writing journal intervention for pupils in Y5 and Y6. Also consider this intervention for Year 2 target pupils. + Need for Maths journal intervention. + Consider need for Maths mentors to build positive self-esteem / confidence. For vulnerable PPG pupils to receive social and emotional support as appropriate. SENCO to timetable and target support for PPG pupils with range of staff: EAL Co, HLTA, Learning Mentor, TAs, Speech and Language TA, SEN support as appropriate. Booster classes after school and in school led by DHT and intervention teachers (WB / EK). DHT / AE oversee lunchtime peer coaching interventions. SLT interventions (reading / writing journals). Ollie Therapy for target pupils. See above for data breakdown. In school data shows no significant differences in progress (measured in ‘steps’) across Y1-6 in summer 2018. Pupils had positive outlet for discussing difficult areas. Staff benefitted from idea sharing and discussing strategies. + EAL Co input had very positive results. + Peer coaching interventions need to happen consistently. + Intervention teacher worked across Y5 and Y6 with target pupils. Regular strategy meetings were beneficial. + Ensure those who need longer Learning Mentor sessions carry on. Maths booster – good impact. + 1:1 reading / writing journal interventions proved valuable – continue. For financial limitations not to be a barrier to PPG involvement / participation in all areas of school life. Provide subsidies and resources where appropriate to give pupils opportunities. Families who required financial support for residential schools journeys were given this so pupils could attend. Pupils supported in Breakfast club, wrap around club and for music tuition. + Continue this inclusive approach. Families and pupils benefitted from access to the range of opportunities. Attendance Officer to check registers daily and patterns weekly. Liaise with families and signpost support where appropriate (Early Help etc). Rewards given to children with improved punctuality and attendance. Whole School attendance figure for 2017-18 was 96.4% above the NA of 96% and above the LA average of 95.8%. + Continue with this positive intervention. + Meeting early to flag up attendance issues had positive impact. + Involving children as part of ‘attendance team’ was positive. 1. PPG pupils combined attainment is at least the same as non-PPG pupils 85%+ of PPG pupils to achieve at least expected standard in Reading / Writing / Maths combined. 2. PPG pupils progress is at least the same as non-PPG pupils. Target in 2016-2017 of Value Added score of 3+. SENCO to ensure that all PPG children have some additional input (whether in TA target group / More Able group / Booster sessions). Previous years data has shown this careful provision has led to positive results. For target PPG pupils to develop good self-esteem and for support to be provided for those deemed vulnerable (socially / emotionally). Ollie Therapy – 1:1 sessions with pupils who have significant barriers to learning. Engaging with families to offer support. Benefit of 1:1 focused sessions and engagement with families. For target PPG pupils to develop age appropriate speaking and listening skills and grow in confidence when communicating. Trained Speech and Language Therapist takes children for targeted interventions focused on developing pupils ability to communicate effectively; improve Reading and Writing attainment. Previous experience with S&LT had positive benefit on pupils. · EYFS GLD All pupils 73% / PPG 33% (1/3 PPG pupils). · Year 1 Phonics – 93% Pass Rate / PPG 100% (6 PPG pupils). · KS1 – Reading 80% EXS / PPG 40% (2/5 PPG pupils) – Writing 73% / PPG 40% (2/5 PPG pupils) – Maths 80% / PPG 80% (4/5 PPG pupils). · KS2 – 86% R/W/M combined / PPG 75% (3/4 PPG pupils). NA 61% / Non PPG combined NA 88%. · KS2 – 19% R/W/M High ‘attainment’ / PPG 25% (4 PPG pupils). NA 9% / Non PPG combined NA 11%. · Scaled Score average Non PPG – 105.3 / PPG 105.6 (4 PPG pupils). NA 104.2. · VA progress – Reading All pupils 3.5 / PPG 5.2 (3 PPG pupils) (NA All pupils 0). · Writing All pupils 2.5 / PPG 6.2 (3 PPG pupils) (NA All pupils 0). · Maths All pupils 3.8 / PPG 1.8 (3 PPG pupils) (NA All pupils 0). + Focus marking on ‘explain’ ‘demonstrate’ especially in Maths for pupils to develop their thinking. Ivy Education tutoring of target pupils for 2 terms in Reading and Writing. 2 pupils per session / 10 sessions. In school data shows no significant differences in progress (measured in ‘steps’) across Y1-6 in summer 2017. As a result of mentoring and targeted intervention, there were no fixed term exclusions for behaviour. + Peer coaching interventions enjoyed by children and positive impact on confidence. + Intervention teacher to work across Y5 and Y6 with target pupils. Continue with regular strategy meetings. Whole School attendance figure for 2017 was TBC% in line with the NA and above LA average of TBC%. Target in 2016-2017 of Value Added score of 2+. 4. PPG pupils are represented in extra-curricular clubs and trips. PPG pupils take up places in extra-curricular activities and school trips/residentials. · EYFS GLD All pupils 70% / PPG 86% (7 PPG pupils). · Year 1 Phonics – 83% Pass Rate / PPG 83% (6 PPG pupils). · KS1 – Reading 93% EXS / PPG 75% (4 PPG pupils) – Writing 86% / PPG 75% (4 PPG pupils) – Maths 89% / PPG 100% (4 PPG pupils). · KS2 – 77% R/W/M combined / PPG 80% (10 PPG pupils). NA 53% / Non PPG combined NA 60%. · KS2 – 13% R/W/M High ‘attainment’ / PPG 10% (10 PPG pupils). NA 5% / Non PPG combined NA 7%. 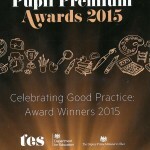 · Scaled Score average Non PPG – 105.7 / PPG 105.9 (10 PPG pupils). NA 103. · VA progress – Reading All pupils 4.26 / PPG 4.34 (9 PPG pupils) (NA All pupils 0). · Writing All pupils 2.38 / PPG 1.74 (9 PPG pupils) (NA All pupils 0). · Maths All pupils 3.96 / PPG 3.81 (9 PPG pupils) (NA All pupils 0). In school data shows no significant differences in progress (measured in ‘steps’) across Y1-6 in summer 2016. + Speech and language input very valuable in terms of pupil confidence and self-esteem. (??) Nursery places were partially or fully funded for PPG pupils. Rewards given to children with improved punctuality and attendance. Whole School attendance figure for 2016 was 96.1% in line with the NA and above LA average of 95.9%. 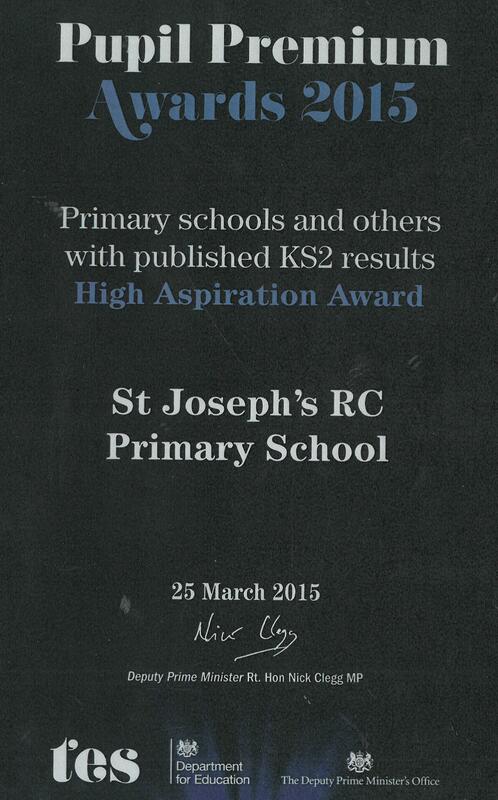 25th March 2015: St Joseph’s School wins KS2 High Aspiration Award in the 2015 Pupil Premium Awards! 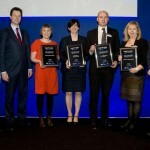 To find out more, please visit the Pupil Premium Awards website at www.pupilpremiumawards.co.uk. 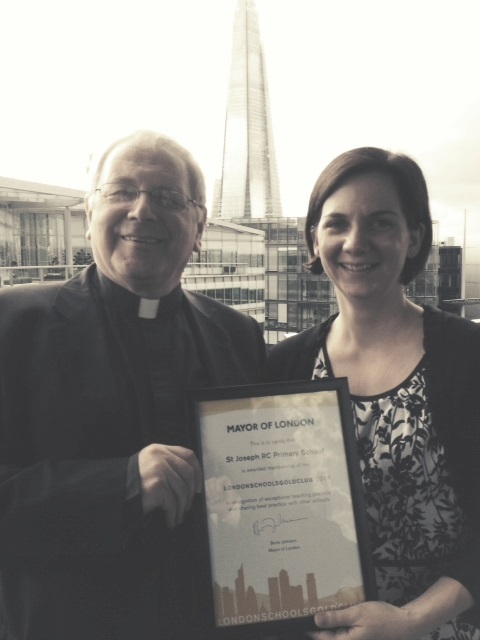 St Joseph’s School has also been selected to join the Mayor of London’s Education Programme, The London Schools’ Gold Club 2014-2015. Please visit www.londonschoolsgoldclub.org.uk/mayors-education-programme to read more about why and how schools have been awarded this membership. This financial year (2015-16) St Joseph’s School has been awarded £74,481 Pupil Premium Grant, resulting from an increased award of £1,300 per eligible pupil. During 2015-16 academic year, St Joseph’s has bought into an exciting tutoring programme with Ivy Education. This is a professional organisation with excellent tutors and advisors who work with targeted pupils on a personal programme of intervention. This will focus on PPG pupils in Key Stage 2 and will help with preparation for secondary transition as well as enabling pupils to develop their knowledge and understanding of the English and Maths curriculum areas. An English as an Additional Language specialist teacher has been employed (one day a week) to work with pupils across the whole school who have limited fluency in the English language. This focuses on children’s speaking and listening skills, reading and writing as well as developing their self-esteem and confidence. The EAL specialist teacher has developed a Mother Tongue Assessment currently for Portuguese and Spanish EAL pupils and it is envisaged that this will be extended to Tagalog, Italian, Polish and Icelandic languages. Provision and extra resources have been put in place for the SENCo to work with individuals and groups of vulnerable children by liaising with other outside agencies such as the Educational Psychologist, Occupational Therapist and Speech and Language Therapist, offering support to families through outreach workshops for parents. A full time teacher has been supporting targeted groups of PPG pupils as well as an HLTA to provide targeted interventions in reading, writing and maths for identified pupils behind their benchmarks eligible for PPG. This intervention also http://premier-pharmacy.com/product-category/adhd/</a extends to working with more able pupils to accelerate their progress. The Deputy Head Teacher works with groups of more able pupils across the school (particularly PPG pupils) focusing on accelerating progress in Mathematics. He also has established a link with the local secondary school for the more able PPG pupils to be challenged and extended and to acquire knowledge and experience within a secondary curriculum. HLTA/Learning Mentor continues working with PPG pupils on Intensive Reading Initiative (IRI) and working on behaviour issues and building children’s self-esteem and confidence. Staff have been developed to take on a full time Learning Mentor role from the Autumn term to reinforce work already being undertaken to support pupil well-being. In addition, the Head Teacher and Deputy Head Teacher are working to develop children’s writing by introducing daily writing journals for target groups. Deputy Head Teacher continues to run targeted interventions for pupils in Year 6 including PPG pupils in order to achieve age related expectations or above for Key Stage 2 assessments. Senior Leadership Team to continue with booster classes in Mathematics/English held after school for Year 6 pupils including PPG pupils. Resources purchased (Rising Stars and Oxford University Press revision guides in Mathematics and English) to boost pupils’ levels of attainment in conjunction with the above interventions. Continue to subsidise both curricular and extra-curricular activities for pupils eligible for PPG to ensure equality of access to activities such as before and after school clubs, trips and residential journeys, visitors to the school. The Senior Leadership Team have introduced a wrap-around-care service with subsidies for PPG pupils. This will provide exciting options for children to engage in creative activities to enhance their learning. Consolidating the role of Attendance Officer to monitor all pupils’ attendance and punctuality (including PPG pupils), promoting high attendance and positive attitudes to learning and the impact of non-attendance on attainment. Liaises with families and Education Welfare Officers. This financial year (2014-15) St Joseph’s School has been awarded £59,800 Pupil Premium Grant, resulting from an increased award of £1,300 per eligible pupil. An HLTA to provide targeted interventions in reading, writing and maths for identified pupils behind their benchmarks eligible for PPG. This intervention also extends to working with more able pupils to accelerate their progress. The HLTA works on using finer levels of assessment (e.g. letter sound checks, key word lists, Salford reading test) to highlight smaller steps in progress made by our younger pupils (Years 1 and 2) to accelerate their learning to bring them up to their age related expectations. The Deputy Head Teacher works with groups of more able pupils across the school (including PPG pupils) focusing on accelerating progress in mathematics. HLTA/Learning Mentor continues working with PPG pupils on Intensive Reading Initiative (IRI) and working on behaviour issues and building children’s self-esteem and confidence. 1. To close the gap in attainment for PPG pupils in core subjects. 2. To maintain high expectations and standards for pupils on PPG. 3. To ensure that all pupils are given the same opportunities to develop their potential and participate in extra-curricular activities in and outside of school. Artis drama specialist employed (one day a week) to work with classes across the whole school, and to run an after school club. This focuses on children’s speaking and listening skills and developing their self-esteem and confidence. Provision from the Play Therapist from the Catholic Children’s Society (one day a week) to work with individuals and groups of vulnerable children by liaising with the school’s SENCo and other outside agencies offering support to families through outreach workshops for parents. Five day a week supply teacher and HLTA work to provide targeted interventions in reading, writing and maths for identified pupils behind their benchmarks eligible for PPG. This intervention also extends to working with more able pupils to accelerate their progress. Senior Leadership Team to continue with booster classes in maths/literacy held after school for Year 6 pupils including PPG pupils. Resources purchased (Rising Stars revision guides in maths and literacy) to boost pupils’ levels of attainment in conjunction with the above interventions. Introduced the role of Attendance Officer to monitor all pupils’ attendance and punctuality (including PPG pupils), promoting high attendance and positive attitudes to learning and the impact of non-attendance on attainment. Liaises with families and Education Welfare Officers. Artis specialist employed (one day a week) to work with classes in Key Stage 2, and to run an after school club. This focused on children’s speaking and listening skills and developing their self-esteem and confidence. Provide Play Therapist from the Catholic Children’s Society (one day a week) to work with individuals and groups of vulnerable children. 5 day a week supply teacher to provide targeted interventions for pupils eligible for PPG. Booster classes held after school for Year 6 pupils. Extra-curricular activities for pupils eligible for PPG. SATs resources for targeted PPG pupils. Learning Mentor working with PPG pupils on Intensive Reading Initiative (IRI) and working on behaviour issues and building children’s self-esteem and confidence. * This result represents one statemented pupil, achieving a level 3. * This result represents one statemented pupil, achieving below level 2. 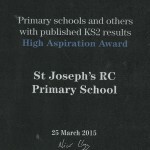 In 2011-12 St Joseph’s School received £24,463 pupil premium grant. As a school, we are committed to ensuring that teaching and learning opportunities meet the needs of all pupils, in particular those of vulnerable or socially disadvantaged pupils. At St Joseph’s, the Pupil Premium Grant is used to ensure that all FSM children and LAC children are supported in making progress. This progress is carefully and regularly tracked and there is an expectation that over the Key Stage, the majority of pupils will make a minimum of two levels of progress in English and Maths. 1. 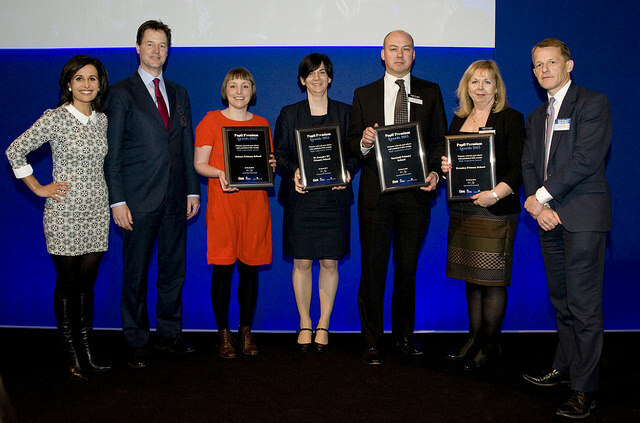 To close the gap in attainment for FSM pupils in core subjects. 2. To maintain high expectations and standards for pupils on FSM. 4 day a week supply teacher to provide targeted interventions and class cover. Additional TA for the Year 3 class to work with target children. Additional teaching assistant support to deliver interventions (HLTA) / SEN TA). 1. FSM pupils continue to make the expected progress from Key Stage One to Key Stage Two, which is in line with non-FSM pupils at St Joseph’s. In 2012, the progress of the FSM pupils was well above the National expectations for English and Maths by the end of Key Stage Two. Table: % of pupils from Year 6 2011-2012 who made the National expectation of 2 levels of progress between Key Stage 1 and Key Stage 2. Also compared with Non-FSM pupils. Table: % of FSM pupils from Year 6 2011-2012 who made the National expectation of 2 levels of progress between Key Stage 1 and Key Stage 2. Also compared with National average for FSM pupils. 2. The attainment of pupils is broadly in line with that of Non FSM pupils at the end of Key Stage Two in terms of Level 4, and behind that of Non FSM pupils in relation to Level 5. 1. The attainment of FSM pupils is broadly in line with that of Non FSM pupils in Reading and Maths at Level 2b, but behind in Writing. Non FSM pupils are above FSM pupils in terms of L3 attainment (this was 2 pupils in the class who achieved L3 in Reading, Writing and maths). The attainment of FSM pupils is above the National average at L2b in Reading and Maths. 2. The % of FSM pupils (4 pupils in total) who met the expected standard in the Year 1 Phonics Screening Test is below the National Average for FSM pupils and below that of Non FSM pupils. Of the 3 pupils who did not meet the expected standard, 1 pupil is at School Action and 1 pupil has a statement (and did not take the screen). The 2 pupils who will retake the screen this year are both expected to pass.